In February 2019, CLIA proposed new acceptable performance specifications. 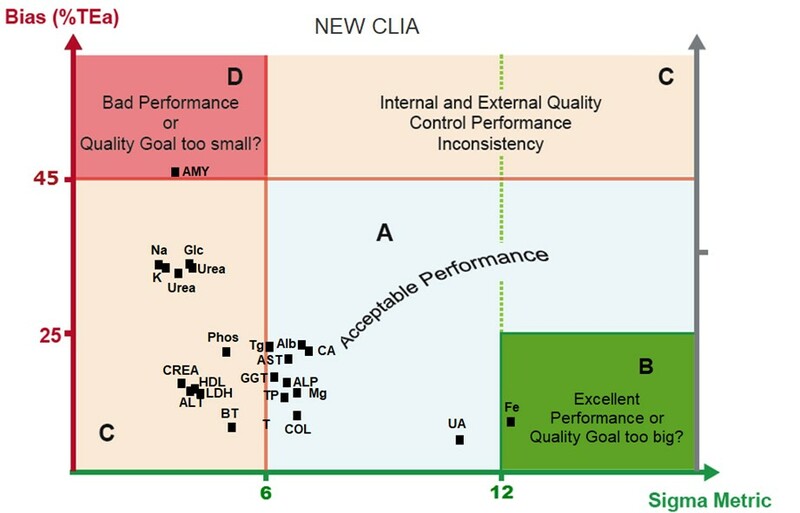 Using the data from a laboratory in Uruguay, the new proposed goals are compared to the current CLIA goals. Are the new goals too wide, too tight, or just right? 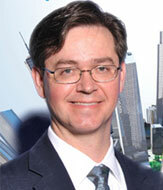 New proposed goals for CLIA: Fit for Purpose? The new proposal for updated acceptable performance goals in CLIA, listed in the Federal Register, mentions that the process of deciding on what goals to apply was assisted by a simulation of the goals on some existing data from various proficiency testing (PT) programs. This is encouraging, it suggests that they "means tested" the goals to make sure that what they developed was neither too small, nor too large. However, on the consumer side, those simulations are not available for us to evaluate. So if we're assessing the new CLIA goals, we need to use other tools at our disposal. 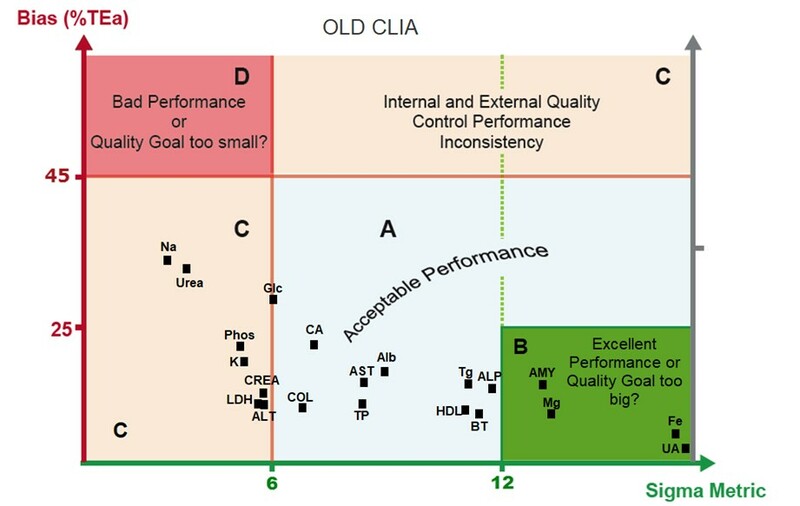 Last year, Varela and Pacheco published a Goal Assessment Graphic matrix that evaluate performance specifications and helps the laboratories to choose what quality goals better fits their test analytical performances. That is, it tests the appropriateness of an analytical performance specification through the graphing of the Sigma-metric vs. the bias. Different zones on this chart indicate acceptable performance (of the goal), goals that are too big, and goals that are too small. Comprehensive evaluation of the internal and external quality control to redefine analytical quality goals. Varela B, Pacheco G. Biochem Med (Zagreb). 2018 Jun 15;28(2):020710. doi: 10.11613/BM.2018.020710. Refer to the paper above, free to access, to understand how to interpret the graphs below. The same set of laboratory performance data, from LAC - Laboratorio de Analisis Clinicos - is used to evaluate goals. LAC is one of the Sigma VP laboratories. Zone B, which had 4 assays in the old CLIA, now has just one under the new CLIA proposal. Zone A, which had 10 assays in the old CLIA, has 10 in the new CLIA proposal. Zone C, which had 7 assays in the old CLIA, has 11 in the new CLIA proposal. Zone D, which was empty in the old CLIA, has 1 method in the new CLIA proposal. The tightening of goals is definitely reducing the Sigma-metric of the assays. More assays are moving into the zones where the goals are considered possibly too tight. Some of those assays will be at 4 and 5 Sigma, which is not bad at all, but for assays below 3 Sigma, that here is taken to indicate that the goals are too challenging. Sodium and Urea, in particular, were among the tightest goals in the current CLIA goal system, and they haven't gotten any better. This is a useful piece of information. Every laboratory considering the impact of these goals should consider using their current performance data and simulating the "judgement" of these new goals. In some cases, your laboratory will be judged more harshly - but this may be a case where we should be judging the goal, not the laboratory. The comment period will end on April 5th, 2019. If you may be impacted by these changes, we strongly encourage that you share your reaction, positive or negative to CMS.